After major conflict in the Gaza strip in 2007-2008, UNESCO conducted a study to understand how the education system had been affected by the current situation in Gaza from a psychosocial perspective. In particular, how are learners, teachers, students and professors across the system coping? 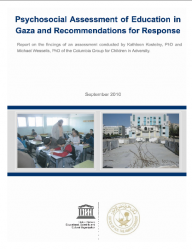 To answer this question, a large scale assessment that covered all levels of education and all the governorates in Gaza was conducted from December 2009 to March 2010. The findings show that students and teachers alike face high levels of psychosocial challenges. Since the war, learning outcomes have decreased significantly.